Spanish Fork Utah is a small town located in Utah County, Utah with a population of 37,000. Spanish Fork Utah was founded by Mormon settlers in 1851. Whether you are on vacation visiting the beautiful Spanish Fork River Park or new in town, you don’t have time for dental emergencies. When you want to find a dentist with walk in availability or extended hours in Spanish Fork, UT turn to emergencydentistsusa.com. We have worked to compile a list of dentists and dental specialists in the local area and present them to you. The only thing you need to do is view the list and choose a dentist you want to visit then give them a call. If you are in a rush or cannot view the list right now, but you still need to identify a dentist, call our toll-free dentist finder hotline. When you call our hotline at emergencydentistsusa.com our friendly staff is ready to assist you with all of your emergency dental needs. We will work with you to find a dentist in your local area and even schedule your first appointment for you. We do suggest that you arrive 20 minutes early to your first appointment and have your insurance card, ID, and any applicable co-payments with you. We know you may find it difficult to find a dentist you can trust when you are far from home. Spanish Fork makes it easy with a fine selection of general and pediatric dentists that can get you in when those dental emergencies strike. If your new dentist finds something that requires a specialist treatment, we also have a great selection of orthodontists, cosmetic dentists, oral surgeons, and much more. 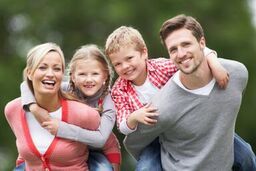 Description: Rogers Center for Dentistry offers pediatric and general dentistry services for your entire family. Comfort during your dental procedure is the number one priority at Rogers Center for Dentistry. The doctor at Rogers Center for Dentistry offers sedation dental services for those who have dental anxiety. Rogers Center for Dentistry is a general dental office which offers preventative and emergency dental services, including but not limited to cleanings, fillings, root canal therapy, crowns, and much more. If you require specialty dental treatment, Dr Rogers will be happy to refer you to one of his highly qualified colleagues. Description: Canyon Dental Clinic is a dental practice that specializes in preventative and emergency dental services for the entire family. The dentist at Canyon Dental Clinic has added experience in periodontic dentistry and tooth restoration. If you need a cleaning or more specialized dental services including root canal therapy, Canyon Dental Clinic is here to help. Description: Stonehaven Dental provides a wide array of pediatric and general dentistry services to meet your emergency dental needs. The dentists at Stonehaven Dental provide services ranging from cleanings, fillings, root canal therapy, extractions, and crowns for your emergency dental needs. The office of Stonehaven Dental also provides orthodontic and periodontic special dentistry services to meet your unique individual needs. Tooth pain can strike at the worst times including when you are new to town or on your dream vacation. Spanish Fork has a dentist available to meet all of your emergency dental needs. If you have a toothache or any mouth pain lasting for more than two hours you need to be seen by one of Spanish Fork’s general dentists or visit the nearest hospital emergency room to have the problem treated at the earliest stages. When visiting a new dentist, it’s important to check your new dentist’s credentials. This can be done by visiting the Utah Dental Association’s website. If you are unable to access the internet, the receptionist at your new dentist’s office will be happy to assist you in obtaining copies of your new dentist’s credentials when you arrive for your first appointment.